"What a story!" Abhishek Bachchan, playing a cross between a fugitive and a guardian-angel, says wrily at the end of this elegantly crafted whodunit. What a story, indeed. And full marks to writer Althea Delmas Kaushal for crafting a jigsaw that would have made Agatha Christie smile. It wouldn't be incorrect to say, they don't make movies like this anymore. 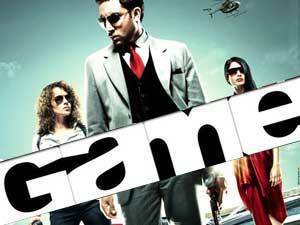 Stylishly crafted, cunning in plot and deft in its narrative thrust, "Game" is one of the most aesthetically-mounted Hindi films in recent times. Huge efforts and resources have gone into shooting the murder mystery in places where intrigue seems infinite, escape seems undesirable and redemption appears as distant as the sound of the waves splashing against rocks that have centuries of stories to tell. Welcome to the Greek island of Samos. Anupam Kher, looking pricey in his tycoon's avatar invites four of the most distinguished elitist-outlaws on this side of Charles Sobhraj. Each has a past tense and a future imperfect. Everyone has a history and a back-projection. This is a world defined by a wealth of unexpressed resentment and smothered anger waiting to erupt. Debutant director Abhinay Deo displays a remarkable grip over the proceedings. Though the narrative moves through a number of continents and exotic cities (Istanbul jumps out at us from the James Bond movies) propelling his tortured characters forward into motions of restless salvation, there is a quietude and grace at the heart of the narration that we've scarcely ever seen in desi whodunits. The crime and its denouement are worked in graphic details. But the narrative is never bogged down by over-punctuation. For a crime thriller that pays a homage to the best traditions of the genre represented by Sherlock Holmes, Agatha Christie and James Hadley Chase, there is a tightly-wound feel to the storytelling, as though the director were moving contrary to the dictates of the genre, without slipping up with the details. If god lies in the details then why does the devil seem to have taken over "Game"? At heart "Game" is a love story about a high-profile gambler and his doomed lady-love…a kind of Bonnie and Clyde with the inherent desperation of the duo's togetherness reined-in and qualified by ripples of elegant punctuation. No hiccups, then, in Abhinay Deo's directorial debut. Like all cinema by filmmakers who come from the ad-world "Game" is a visual feast. Contrary to films by other ad-turned-feature director Deo doesn't unnecessarily abbreviate the shots in the fear of losing audiences' attention. The characters, specially Abhishek Bachchan's, get sufficient breathing space in a script that favours flirting with fate. There is a delicacy in the textures and colours used to bring forward the tensions in the plot. Shashank Tere's art direction and Kartik Vijay's cinematography imbue a gritty cold edge to the spill of blood and the smell of greed. The portions shot on the Greek island are particularly hypnotic, the splashing waves creating a ripple of anxieties in the turbulence of the characters' lives without toppling the storytelling boat over into the sphere of the stormy. Whether it is Anupam Kher as tycoon-host on the mesmeric island or Gauhar Khan as his seductive secretary, the characters never cease to appear glamorous on screen. The performers are eminently watchable. Anupam Kher, Kangna Ranaut, Boman Irani, Shahana Goswami and the underrated Jimmy Sheirgil get the tenor of tantalizing terror right. Sarah Jane Dias is quite a find, though she needs to work on her dancing skills. Her fabulously choreographed dance number suffers from the Two Left Feet Syndrome (hint hint!). Abhishek Bachchan proves once again a master of silences, his eyes conveying the pain of lost love, his lips curling up to convey the cynicism of a man who has seen it all and couldn't care anymore. His two key action sequences are heart-stopping in their credibility. Waltzing wickedly between the incredible and the inevitable "Game" succeeds in sustaining our interest right till the devilish denouement at the end. "Game" is a film that never lets us forget that the whodunit attains an enticing aura only when the characters assume framed postures. Abhinay Deo's narrative walks a fine thin bloodied balance between dread and delight.